Chorizo or chouriço is a term originating from the Iberian Peninsula encompassing several types of pork sausages. Chorizo can be a fresh sausage, in which case it must be cooked before eating. In Europe, it is more frequently a fermented, cured, smoked sausage, in which case it is often sliced and eaten without cooking, and can be added as an ingredient to add flavour to other dishes. 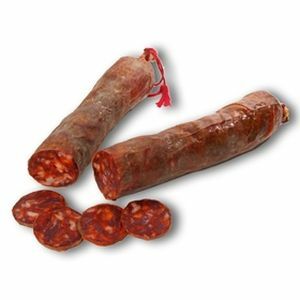 Spanish chorizo and Portuguese chouriço get their distinctive smokiness and deep red color from dried smoked red peppers. Due to culinary tradition and the cost of imported Spanish smoked paprika, Mexican chorizo is usually made with chili peppers, used abundantly in Mexican cuisine. In Latin America, vinegar also tends to be used instead of the white wine usually used in Spain. Traditionally, chorizo is encased in natural casings made from intestines, a method used since Roman times. Some types of chorizo can be eaten without further cooking (e.g. sliced or in a sandwich). Chorizos can be grilled, fried, or simmered in liquid, including apple cider, other strong alcoholic beverage such as aguardiente. It also can be used as a partial replacement for ground beef or pork.